This project is about creating an audio level meter, for example as an environmental noise measuring node in a citizen science project or as a standalone "decibel meter". The plan is to do this by combining an inexpensive WiFi-enabled ESP-32 microcontroller with a standard I2S digital microphone. Every 5 minutes, the measured sound intensity is sent to a central server on the internet using your home WiFi connection. Because we only communicate intensities, this does not reveal audio fragments (conversations for example). The plan is to divide the audio spectrum up into octaves and calculate the total energy in each octave. We can then easily apply sensor/housing specific corrections, do A weighting, etc. The energy in each octave is calculated by applying an FFT (fast fourier transform) on the audio data. The FFT takes in real values and outputs complex values. The intensity in each octave band is by summing the energy in a set of FFT 'bins'. The energy in each bin is calculated as the real part squared plus the imaginary part squared. list of decibel meters available at Conrad. Waag society uses the following microphone in their kit 2.1: Invensense ICS4342. I ordered these INMP441 microphones from Aliexpress. The connection carries only digital signals (max 3 MHz or so). 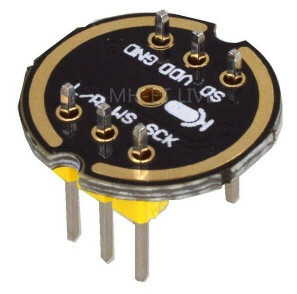 No sensitive analog electronics are needed, the microphone and the microcontroller are simply connected using "dupont" wire. The clock signal is 64 times higher than the sample clock, so at a sample rate of 44100 Hz, this means 2.8 MHz. This might be a bit high for a random wire, probably we should keep this connection short. Initial code can be found on github. On the recorded audio, perform a 4096-point FFT with a windowing function (Gaussian for example). This results in 2048 FFT coefficients. Sum up FFT into power per octave, e.g. top 1024 coefficients represent octave of 11025-22050 Hz, next 512 coefficients represent is 5512-11025 Hz octave, etc. The network receives the raw decibel values and can apply corrections for specific microphones, do A-weighting, etc. This page was last modified on 22 April 2019, at 23:52.